I just made my best loaf of bread ever. Not that I have a lot of loaves to compare it to. I mean, quick breads I can do. Breads of a yeasty persuasion? Errrr… Notsomuch. But there is something about bread making that I’ve always been attracted to. It has something to do with kneading. And rising. And kneading. And rising. Okay, and I just really love fresh bread. Since moving back home, I’ve been spending a lot of time getting acquainted with my new friend Yeast. I wanted this friendship to finally work. Yeast is very temperamental after all, and I find there is little information out there as to how to actually deal with it. Do I “sprinkle” or “dissolve”? How warm is “warm”? Why the eff won’t my dough rise, again!? Well, after a lot of trial and error, I am figuring out some tricks that work for getting yeast to work for me, every time. 1. Use a thermometer to get the liquid the right temperature. I’ve killed many packets of yeast by trying to proof it in too-warm liquids. Perhaps my “lukewarm” is just warmer than the normal person. Around 100F seems to be the perfect temp to get yeast active. 2. Use a pinch of sugar. Yeast likes a sugary liquid. It’s got a sweet tooth. 3. Stir the yeast in. A lot of recipes say “sprinkle yeast over top.” Which I don’t get because my yeast never worked when sprinkled and left sitting on the top of the liquid. To activate, yeast needs access to the liquid, which is does not get when all bunched up on top. 4. If I’m proofing the yeast in water first, I like to cover it with a damp towel and put it in the microwave (not turned on, just to hang out). I don’t think the microwave has much to do with it, but it’s never failed me and I’m slightly superstitious. Yes, about yeast. 5. This is what “bubbly” or “frothy” yeast looks like. I never knew that until someone showed me. There were a few times I thought the yeast was ready when it wasn’t simply because I didn’t know what active yeast looked like. 6. A lot of people recommend letting your dough rise in a turned-off oven with the light on. It needs a little warmth to rise after all. But that never used to work for me. I figured it was because our oven bulb sucked. Until one day I pushed the bowl of dough towards the back of the oven right next to the bulb and whammo! 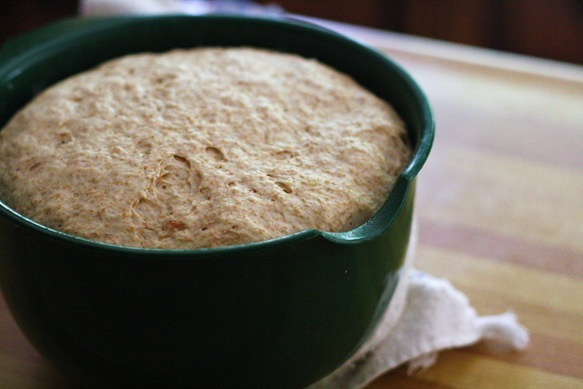 Growing dough. Just make sure nothing is touching the bulb. That’s how house fires start. Trust me. 7. Speaking of towels, cover your rising dough with a damp one. Yeasty dough looooves moisture! 8. Finally, don’t be stingy on rising time. Sometimes it takes longer than the recipe says. I suggest making plans instead of relying on watching dough rise to entertain you. It’s with all of this, that I’ve ended up with some superb yeasty experiments as of late. 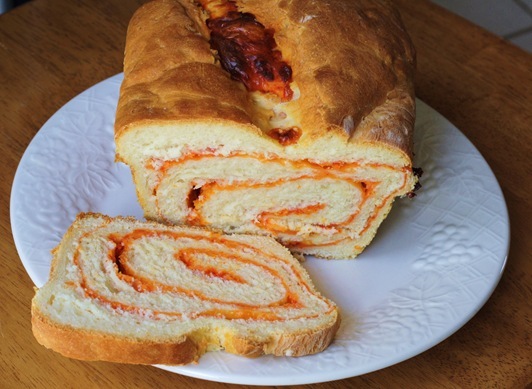 Including this Cheddar-Sriracha Swirl Bread as my best loaf to date. Cheesy. Spicy. Soft and chewy. Beware, it is a touch spicy. 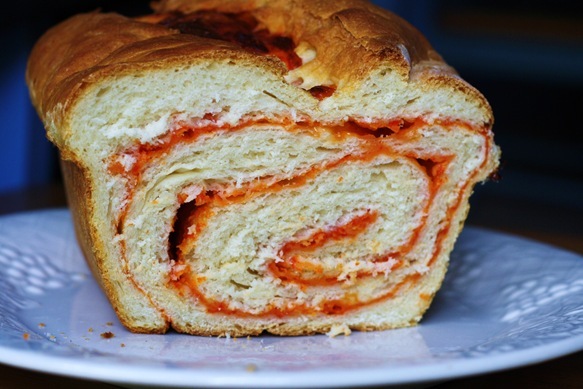 If I make this again, I might take the sriracha down a notch and add more cheese. Also, be sure to read the instructions verrrry carefully, then follow them to a tee. 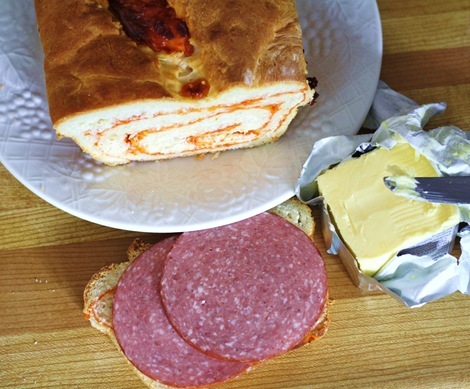 Spicy cheddar bread is best enjoyed with a thin spread of butter and sliced salami. Or with a smear of hummus. Or warmed in the microwave as a bedtime snack. That’s probably why there was only half a loaf left by the time I got around to taking pictures.